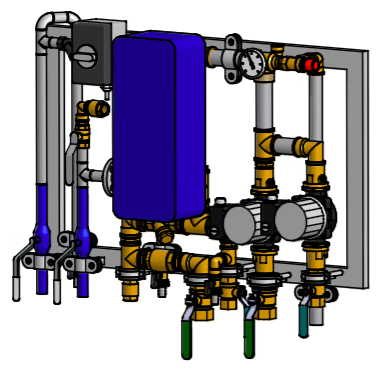 Family is a series of heat exchanger plants suitable for pressure-independent connection of single-family houses and smaller buildings to long-distance heat distribution grids. The secondary heating circuit is separated from the primary circuit by an Alfa Laval CB plate heat exchanger. The secondary heating water temperature is adjusted by a two-way control valve. DHW storage tank with electric actuator. Hot water is produced in a storage tank with a heating element using a secondary heating medium. The tank capacity is chosen based on the peak demand for hot water. In situations that the control system interprets as an accident, the valve closes automatically.